Naked-Stem Wallflower is a perennial herb with showy lilac, violet or white flowers, about 2 cm across, borne atop leafless stems, and with a dense rosette of long-stalked, inverted-lanceshaped leaves. Petals are 1.5-2.2 cm long, the stalks of the petals much longer than the sepals which are about 1 cm. Leaves are 4-15 cm long, glandular hairy, usually entire, but sometimes with small lobes. Stems are up to 10 cm in flowering, 10-30 cm during fruiting. Fruit is 3-6.5 cm, glandular, often with way margin. 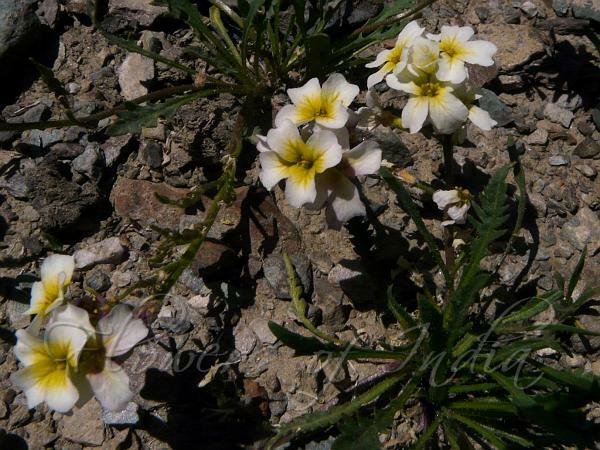 Naked-Stem Wallflower is found on rocky slope in the Himalayas, from Afghanistan to Bhutan, at altitudes of 4300-5300 m. Quite common in Ladakh. Flowering: June-July.